Before we head into the 2018 season, we want to recognize the organizations, donors and supporters who made our 2017 season a successful one! We could not have done it without your help! We are close partners with Sandy Point National Wildlife Refuge staff – we help them during the season to meet the refuge mandate of protecting the leatherback turtles that nest there. 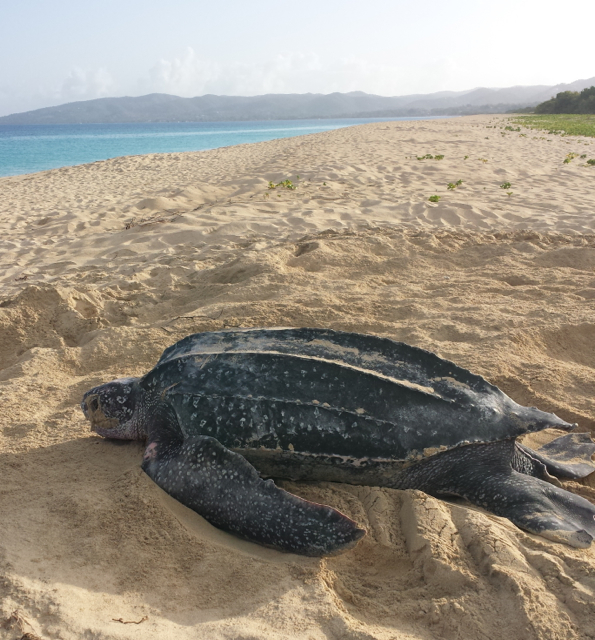 The Leatherback Project has been running now for over 40 years, thanks to the hard work of the refuge staff. We are so lucky to be part of that legacy. The amazing Cottages by the Sea provides us a home base at Turtle Camp – we love it there! Plus the staff is with us every step of the way with encouragement and smiles. Columbia Sportswear keeps us outfitted with the best field gear! And of course we have a great team at The Ocean Foundation who support us in many ways to run our programs and research. We are so grateful to our 2016/ 2017 donors and supporters! They include: Joanne McKinney, Ara and Joanne Asadourian, Louisa Porter, Donna Dutton, Tony and Ellen Drago, Mike and Angelica Lunney, Erin LaCasella, L.J. Chapman, Jim and Virginia Jessup, Sarah Luick, Niki Desjardin, Ella Roden and Guido Melliger, Darcy Owen, Judie and Charles Mullins, Nevada Trager, Amy Fulk, Donna and Thomas Piorkowski, Andy Simler, Joasia Pyrz, Amy Semple, Mike McKay, Susie Knoell, Violet and Christella Campbell, Sam Evans, Greg Rouse and Amy Halseth, Pamela Ross Fogel, Donna Boles, Peter and Jill White, Jim Hutchinson and family, Mindy Stallings, Howard Thomas Foster, Dee Ullrich, Sabrina Alongi and Gabby Carvajal, Catherine McClellan, Andrea Schultz, Kyle Woudstra, Emma Dutton, Tim Mauney and family, and Lorna Larsen. Thanks also to all of you who purchased t-shirts during our Turtle Talks or online! We especially want to thank all our volunteers, helpers, cheerleaders and parents who supported each and every one of us on the nesting beach! Here’s to a great 2018 season! See how you can get involved! Name a turtle for your Valentine!